And we’re back in the USA! Our trip concluded with the student Tagtool performances, which went off without a hitch… that is, until it started pouring rain! It ended up being a cathartic end to a crazy 9 days in Havana, in which we dealt with delays, reschedules, denials of permission for the workshop by the government (really! ), but in the end succeeded in accomplishing nearly everything we set out to do. The students were naturals with Tagtool. Speaking to the immense kindness and generosity we had experienced so far from nearly every Cuban we’d met, some kind people allowed us to use their home’s electricity to power the projector and a stereo. Salsa blared and the students lit up the night with awesome drawings and animations. They were so talented with the app, and did awesome things that drew a pretty big crowd from the park we were in! It was such a privilege to be allowed into Cuba to see the amazing city of Havana, and to work beside so many people who were so kind and helpful. These have been 9 days we will never forget. As Cuba begins to open up to the outside world, Havana will no doubt begin to change, and fast. Developers will move in and change the face of the city. Residents will experience gentrification. Modernity will arrive, but at what cost? We are so lucky to have been able to experience the country while it is standing at the threshold between past and future, and to have met so many people and heard so many stories. 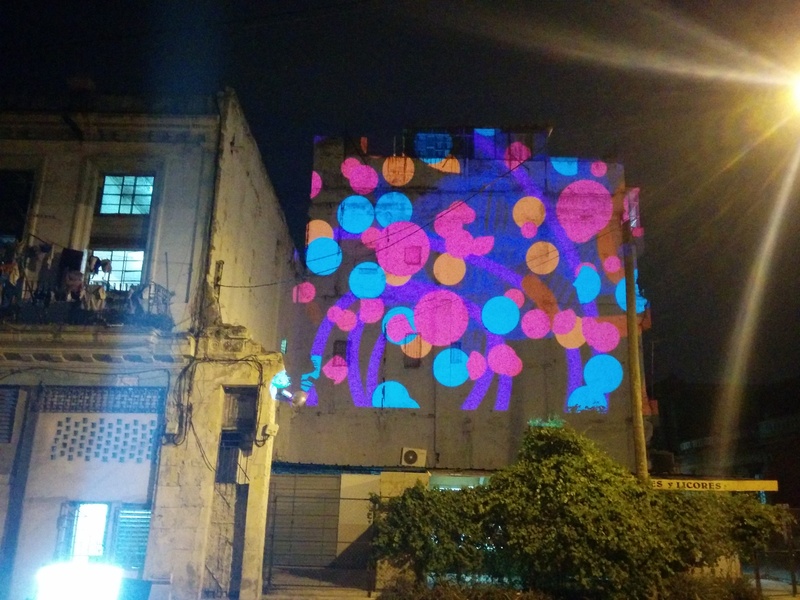 Projecting pARTicles will be on view for the next month at the Pabellon Cuba as part of the Bienal de la Habana. We are all so proud of the work we accomplished, and if you can, please go experience this installation and the rest of the festival. There’s no better way to experience Havana than to simply go outside and start walking, and this festival is perfect for just that. We have to thank Agnes for putting her trust in us to accomplish her vision, and we also have to thank the University of New Mexico, The Department of Art and Art History Dean Kymberly Pinder, and The Department of Art and Art History Chair Mary Tsiongas for funding and supporting our trip. It was a trip of a lifetime, and something special and unique that so few have been able to experience. I also must thank my fellow grad students for all their hard work. Cristine was invaluable as the installation leader and head translator. Abbey went above and beyond the call of duty manning the cameras and photographing and filming everything! Adrian took care of the sound recording for the videos, and was our secondary translator and all-around jack of all trades. These three are beyond awesome, and it was a honor to work with them. To see our work, check out our websites! I’ve had a great time writing this blog, but must now sign off. Dr. Luis Flores Castillo, CERN physicst explaining physics concepts to students during the final Projecting Particles workshop.